Family man and all-around nice guy Jim Braddock lugs around enough nobility to put most guys to shame, the task on his shoulders so physically demanding and uncertain that it's a wonder he is able to go home at night and be halfway civil to his children and wife. Reality is certainly not in his favor; a successful prize fighter whose golden days dissipate just as the clout of the Great Depression is set into motion, his life both in and out of the ring are sent into major freefall, a predicament that would be more than enough to cripple any man emotionally. But no, here is a guy who projects the ideals of the working class and an attitude of optimism so resolute that he refuses to cave. For him, failure is not only not an option, but a completely foreign concept. Maybe that is what drives him down a road of new opportunities and success, or maybe it is just sheer luck. In any case, this is the kind of guy whose ambition is just as great as his dignity, and when put to the test he faces those dilemmas like they are nothing more than challengers in a ring begging for a knockout. Moviegoers have love affairs with heroes like these, the kind that seem to live in our shoes and share our problems on a daily basis before ultimately triumphing in the end amidst all sorts of conflicting energy. Director Ron Howard has identified that perception more than once in his career, and he explores it yet again in his latest endeavor "Cinderella Man," a biopic about boxer Jim Braddock's rise, fall and rise again to the top of his profession. Laced with the same undertone that drives most films of this genre, it has just as much in common with traditional boxing movies, perhaps, as it does with "Seabiscuit," another film about people rooting for an underdog while the Great Depression crushes their personal dreams. Is there much difference? Maybe not. With a horse you don't always see yourself as sympathetic, but in both cases you usually find yourself rooting for the one that all odds are against. Braddock is played here by Russell Crowe, whose recent vacation from acting has seemingly helped recharge his on-screen persuasiveness. At the start of the film Braddock is relishing victory from a prize fight, an occasion that is made all the more sweet by the fact that he is welcomed home, quite warm-heartedly, by a devoted wife (Renée Zellweger) and three high-spirited kids. Their happiness is contrasted quite strikingly with what occurs shortly thereafter - after the inevitable stock market crash of 1929, Jim now works an occasional shift at the loading docks, struggling to make ends meat in order to keep a roof over the heads of his loved ones. Gone too is the hard-earned reputation he earned in the ring; barely a draw even at local low-key matches, his license is revoked once his superiors start to see just what kind of financial loss his presence is causing them. Stress from professional struggles also spill over into his personal life, as Jim and his wife Mae argue over what is more beneficial to their children: sending them away to be with financially stable relatives, or keeping them in a damp environment where they are subject to illness just because daddy promised them that the family would never split up. And here we have the stage set for what will slowly but surely become a story about personal rebirth and success, a prospect that is further enhanced by the notion that writers Cliff Hollingsworth and Akiva Goldsman are working with a script that, more or less, probably does not stray too far from the way events really happened. Jim's friend and booking manager Joe Gould (Paul Giamatti) arrives one day and drops an unexpected one-shot boxing job in his lap, which guarantees the fighter a $250 purse regardless of the outcome. Everyone expects Braddock to just merely enter the ring and take a few hits, as he usually has done in recent years. The shocker: when he starts throwing punches again, it's as if the golden boy from years ago never left the ring. He wins the fight. Onlookers buzz with excitement. The investors offer to renew his license, and new fights come his direction. "Is it a comeback? ", press headlines suggest, perhaps not-so-prematurely. If it is, his wife Mae's concern for his safety is certainly drowned out by his own renewed enthusiasm for the support, which he sees as the only light at the end of a long dark tunnel to try and get his family back in a stable lifestyle. As a vehicle for a man like Ron Howard, a director who is more successful in drawing strength from good performances rather than lasting stories, "Cinderella Man" may indeed be his, well, Cinderella story. The movie's appeal is broad and inviting, with a narrative that gets you to care about characters and situations just as much as it gets you involved in the fights themselves, and social underpinnings that are recognized (and accepted) at face value. The movie also draws strength from a few excellent performances, which is the least of the surprises - Crowe for one does a convincing job of mastering the persona of a guy who is loved just because he reminds us so much of ourselves, and Giamatti and Zellweger both deliver respectable supporting work in a movie that could have easily used them as mere props to a much stronger central character. 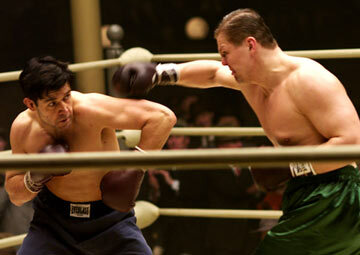 Their work is further enhanced by a technical approach that adds tension to their inner drama, especially when, during a climax involving a face-off with boxing champ Max Baer (Craig Bierko), the camera rapidly cuts through the action of the ring as punches are exchanged at an alarming rate. The result is probably the most realistic-looking fighting you will see in a movie next to Clint Eastwood's "Million Dollar Baby." Alas, to bring that film up here is to also point out some serious problems with Howard's work. Having been only a few months since release, Eastwood's Oscar-winning tragedy is still fresh in our minds, its resounding bravery and brilliance just as unforgettable now as it was on first viewing. It is exactly that great payoff, though, that somewhat deadens the effect of "Cinderella Man." Not only is the movie inferior in comparison, but also far more traditional; whereas "Baby" took a courageous step with its story, this film opts to stay within the studio formula and abide by the rules of your average crowd-pleaser. It takes very few risks. That does not necessarily undermine the work completely, but it does raise a few concerns. Are Howard and Goldsman trying to replicate their success of "A Beautiful Mind" here by following its trajectory? It would appear so. From beginning to end, no matter how far it goes or how hard it tries, there is always this nagging sense in the back of your mind that you are watching yet another elaborate Academy Award trap unfold on screen. Still, to be an audience-grabber at the heart is not always a pointless concept, and here the director and writers prove that the formula still has a few kicks to it. "Cinderella Man" is certainly no "Million Dollar Baby," but with an observant story arc and lots of well-acted moments, it's hard to hold that aspect against it for long.